1999: Played in all 16 games for NO kicked 82 punts for a total of 3,262 gross yards had career-high 11 punts for 409 yards including one in-the-20 at Balt (12/19) one special teams tackle vs. Car (1/2/00) recovered his own fumble and rushed for four yards at SF (9/19). 1998: Served as punter and holder for Buccaneers. Season-high 10 punts for 38.6 avg., four in-the-20 and one TB at Det (9/28). 1997: Suffered shoulder injury in week 6 as he was tied for NFC lead in punts inside the 20. Ranked second in the conference with 39.1 net avg. Kicked eight punts for 395 yards for the third best gross average of his career at Ariz (9/28). Completed a 25-yard pass to Tony Bouie in fake punt attempt. The following week Barnhardt was placed on injured reserve due to a broken collarbone suffered during a TD saving tackle. 1996: Had best season of Tampa Bay history in 1996 as he broke or tied three major Buccaneer records. He kicked in all 16 games for a gross average or 43.1 yards, seventh in NFC, surpassing Reggie Roby's team record of 42.8. 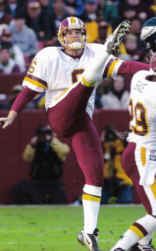 Established a new team record for net punting average, beating Dan Stryzinski's 1992 mark of 36.2 with his 37.7 yards which placed him third in the NFC and sixth overall. Tied a Buccaneer record of most punts in-the-20 with 24. He also helped the team finish the season third in the league with opponents' punt return average of 6.5. Season best performance at SD with 53.3-yard average on two punts (11/7). 1995: Played in all 16 games for Carolina and averaged 41.1 yards with a 35.2 yard net on a career-high 95 punts (second in NFL). Ranked 10th in NFC in gross average and was second in the NFC, fourth in the NFL with a career-best 27 licks inside the 20. Season opener saw Barnhardt's season-high 10 punts including five in-the-20. 1994: For the Saints punted in all 16 games and 43.6 yard average on 67 punts placed him fourth in the NFC and sixth in the league. He also had 14 kicks in-th-20, a 33.5 yard net average with a season-high of seven runs. Barnhardt also made a 21 yard run on a fake punt attempt against SF (9/25). Named the NFC Special Teams Player of the Week with a 47.0 mark on five punts in the season finale vs. Den (12/24). 1993: Kicked in all 16 games and finished with 43.6 yard average on 77 punts. He had the NFL best punts inside the 20 with 26 and just six touchbacks. Placed fourth in the NFC and ninth in the league in gross average and fifth in the NFC and sixth in the NFL in net with a 37.5 yard mark. 1992: From all 16 games played for NO Barnhardt totaled a career-best 44.0 yard gross average and a 37.7-yard net average. This represented a Saints record and placed him second in the NFC and fifth in the NFL. 1991: Punted in all 16 regular season games and placed third in the NFC and seventh in the NFL with 43.5 yard average on 86 kicks. He posted a net average of 35.2 yards rated sixth in the NFC, and his season-long kick was 61 yards and averaged 44.4 yards against KC (9/8). Best game of season showed a 48 yard average on five kicks with a 57 yard long at Min (9/22). And postseason performance included an average of 54 yards on three punts vs. Atl (12/28). 1990: First full season in the NFL. He punted 70 times for the Saints for an average of 42.7 gross yards and 36.2 net. He was rated fourth in the NFC and sixth in the NFL in gross while he ranked third in the NFC and sixth in the NFL in net. 1989: Kicked 11 games for NO and averaged 39.6 yards on 55 punts with a 35.0 yard net average.1988: Punted in four games for Wash before suffering quad injury and placed on injured reserve (10/11). 1987: Signed with Chicago after end of strike. Finished with 17 punts for 42.3-yard gross average and a 35.2 yard net average. Barnhardt also punted four times for 36.3-yard avg in playoff loss to Wash (1/10). 1986: Saw pre-season action for TB but was waived at end of training camp. COLLEGE/PERSONAL: Barnhardt played three seasons at North Carolina after transferring from East Carolina. His overall average was 41.6 yards on 156 career punts. He earned all-America first-team honors as a junior and senior. Personal long punt was 59 yards against Virginia. Earned a bachelor's degree in business. Attended South Rowan Senior High School in China grove, NC where he lettered in football and baseball. Barnhardt has donated much of his time to the Make-a-Wish Foundation and various children's hospitals near his home. Today he lives in Matthews, NC and is single.